At the High Country Stampede Rodeo, we specialize in fun! Fun for kids of all ages, 2 to 80. 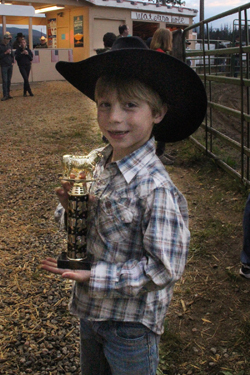 We have two events specifically for children, Mutton Bustin’ and Calf Scramble. Mutton Bustin’ – For sign up just go to the Watering Hole and we will get you signed up. We do have a 20 child limit, so we recommend signing up when you arrive at the rodeo. We love our sheep, so there is a 50 pound limit for the kids! Everyone gets a helmet and a ribbon. 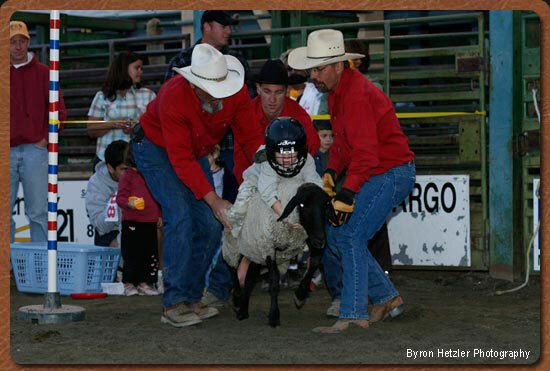 Calf Scramble – For kids 6-12 years old. We let calves with a ribbon tied to their tail loose in the arena. When Bennie (our rodeo clown extraordinaire) gives the signal, those that get a ribbon off the calf’s tail win.